Finally with the Macintosh, Apple managed to offer a system with an intuitive user interface for an acceptable price. Together with the Apple LaserWriter and a built-in network, the Macintosh turned out be extremely popular and commercially successful. The Apple Macintosh computer starts to sell for $2,500 in 1984. * * Lisa’s original price tag was $9,995. With the introduction of the Lisa 2 in 1984 it was reduced to $3,500. Source: Apple Confidential: The Real Story of Apple Computer, Inc. by Owen Linzmayer [Linzmayer 99, p. 61, 77]. The low price could be reached because the computer is equipped less generously than Apple Lisa. It uses a Motorola 68000 processor with a clock speed of 8 MHz. But it has only 128 KB RAM – yet a 64 KB rom for core segments of the operating system. The monitor has 9 inch in diagonal and offers 512 by 342 (squared) pixels at 72 DPI. The Macintosh ships with a 400 K floppy disk drive – a hard disk is not required. Early Apple recognizes the importance of software for the new machine. It is crucial to have a wide range of application programs to compete against IBM PCs market share. Especially an early agreement with Microsoft guarantees the availability of programs like MS Word for the Macintosh. For instance Microsoft Excel is originally developed on the Macintosh platform. The constellation of Macintosh, AppleTalk network, Apple LaserWriter, and the WYSIWYG layout program Aldus PageMaker established the Macintosh as the computer of choice for the desktop publishing revolution [Friedewald 99, p. 404]. Soon the hardware becomes more powerful – so the model of 1984 is just the first in a long and successful product line of Apple Macintosh computers. This thesis for example is written on a Macintosh PowerBook with 192 MB RAM and a processor speed of 400 MHz. What the Lisa Desktop Manager is to the Lisa, is the Finder to the Macintosh. Icons are used to represent disks, hard drives, folders, application programs, and documents. Items are stored in a hierarchy of nested folders, and a trash can completes the desktop metaphor. Overlapping windows are used to display the content of folders. The Finder release of 1991 introduces the notion of an alias. An icon of type alias is a reference to an arbitrary Finder item, that can be used as a substitute for the original item. An alias can be created with ease to virtually store the item at a second location in the tree structure of folders. * * Microsoft will implement this concept as ‘shortcuts’ in Windows 95. Why don’t we have the compound document model in use today? Because the Macintosh was a 128-kilobyte machine with a single disk drive. A user couldn’t possibly have more than one tool in the computer at any time because there wasn’t room. Since only one tool could be used with a document, then the tool might as well handle the opening and closing of that document. [They] started up the Mac, showing the Finder, then launched MacWrite. MacWrite opened up with a new, full-screen document, as it always did. They typed a few lines, then grabbed the mouse and headed for the size box, down at the corner of the window. When they shrank the window back, the [Finder], with all its files and folders, was revealed beneath. We were totally blown away. Totally. The MultiFinder solves the dilemma of preemption between application programs for the Macintosh. Now a document window and a Finder window are allowed to overlap each other, and the user can switch between tasks with a simple click – as Smalltalk and Apple Lisa have demonstrated before. MultiFinder was delivered as an option to the Finder starting in 1988, until it became standard with System 7 in 1991 [Linzmayer 99, p. 234]. Another drawback – compared to Lisa – was the burden to explicitly save changes to documents. This problem is also caused by the early hardware limitations of the Macintosh. A hard disk was not specified for a minimal Macintosh installation. But the floppy disk drive could either hold the program disk or the disk for saving documents. Hence an explicit SAVE command was needed that incidentally forced the swapping of disks. Automatic saving would have caused a lot of inconvenience to the user [Tognazzini 96, p. 129]. All these critical remarks should not deny the merits of the Macintosh user interface. Apple has published well elaborated style guides that define user interface conventions for program developers. The Macintosh Human Interface Guidelines [Apple 95] explain how applications should be designed in order to be consistent with the overall Macintosh environment. Correct naming of menu commands, keyboard shortcuts, use of icons, layout of control elements, use of dialogs, how to give visual feedback, are just a few topics that are important for the design of applications. A lot of software ergonomic knowledge has been accumulated and communicated to software engineers. Fig. 3.13 Self-referential screenshot of this document in Adobe FrameMaker under Mac OS 9.0. The tool window “ƒ Catalog” offers predefined character styles for text edits. The menu bar is located at the top edge of the screen. 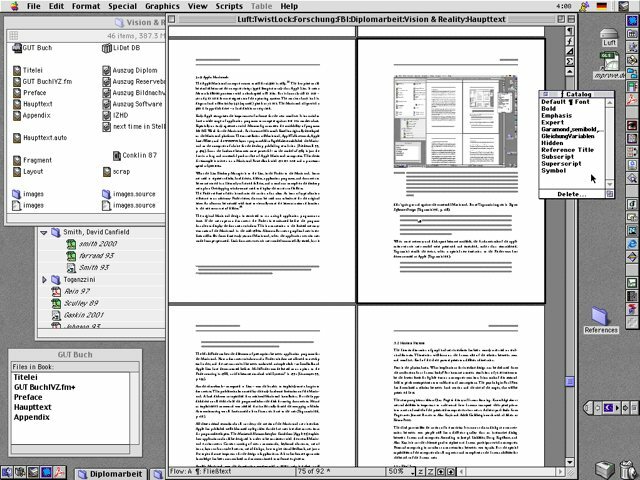 The two inactive windows (top left) belong to the Finder – “GUT Buch” is a FrameMaker’s project window, that assembles the chapter documents into a book. To the right are a few desktop icons: A hard disk, an alias, a folder, a desktop printer, and the trash can. Update 12/2018: The small application icons at the edges are provided by an extension and predate the Dock of MacOS X. The run of small icons at the right edge and bottom left give access to frequently used application programs. Apple’s Macintosh was the dominating system with a WIMP user interface until Microsoft turned into a serious competitor with the introduction of Windows 3 for PCs during the early 1990s and its successor Windows 95. Apple continuously lost market share, and Microsoft Windows became the prevailing operating system with a WIMP-based graphical user interface. Apple’s current operating system is Mac OS 9. It is a direct descendant of the original version from 1984. With respect to the graphical user interface Mac OS 9, Microsoft Windows, and even the new Mac OS X build on the same principles that have been established for the first generations of Macintosh computers during the 1980s. Neither Apple, nor any other manufacturer of graphical user interfaces for personal computers has made an successful attempt to solve such obstacles in the human-computer interaction that have been described above. Nearly all concepts are faithfully copied from the original Macintosh interface design. LisaFAQ: What Lisa Websites are out there?